November 4, 2018 – Goshen, IN…It’s not often that you can find a gaming clan, league, or group that’s been around for 10 years, let alone a sim racing sanction that’s lasted for 15. 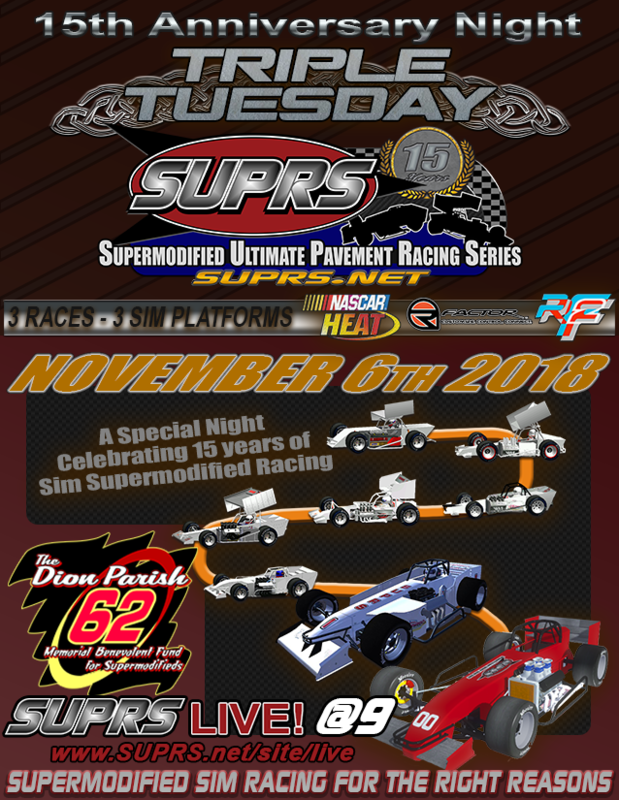 But this week the Supermodified Ultimate Pavement Racing Series, (SUPRS), celebrates that very fact when they come together for a special night of racing and remembering on Election Day 2018 for SUPRS 15th Anniversary Special. Calling it “Triple Tuesday” the original online supermodified sim racing sanction plans to run three different gaming platforms using three different modifications at three different tracks to showcase their history with an eye on the future. SUPRS 15th Anniversary Special “Triple Tuesday” event promises to be something few sim racers have participated in. 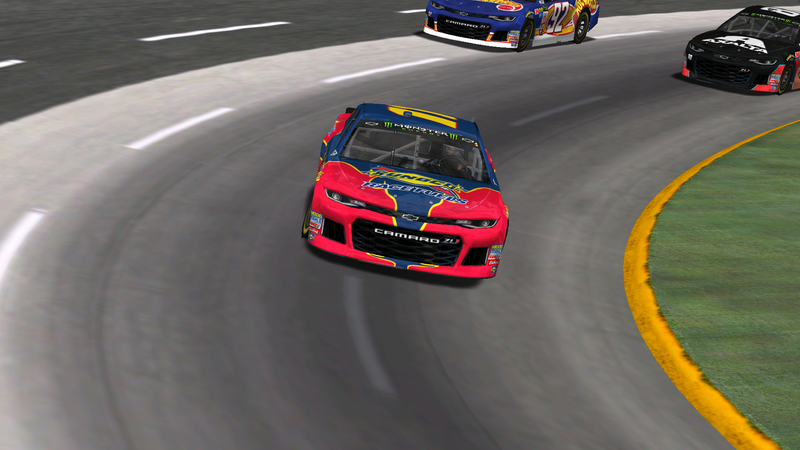 Utilizing the first in-house, scratch-built modification for NASCAR Heat, then moving the current rFactor mod, (also built in-house), and finishing up with a brand-new, never seen rFactor2 supermodified built in-house, is sure to make for a challenging but fun night of racing. All three races are scheduled for 33 laps with the first two races are points paying shows. The first race is part of SUPRS 14 event NASCAR Heat Supermodified Challenge which is open to the public. and uses the NHSM, (NASCAR Heat SuperModified), mod built by Shaker Designs’ Kevin Marine on former SUPRS designer, Doug “Flash” Forgue’s Paved_Featherlite Speedway. Moving to a new release of their rFactor wing supermodified for race two, the SUPRS racers will take on Richmond International Raceway to showcase a brand-new Belfab supermodified chassis and an articulating wing that’s never been done before. Finally, the last 33 lap show will showcase SUPRS yet to be released rFactor2 supermodified which breaks new ground for supermodified sim racing. The exhibition takes place at SUPRS Oswego Speedway, updated to take advantage of the more modern rFactor2 gaming engine. SUPRS 15th Anniversary Special “Triple Tuesday” takes place on Election Day, November 6, 2018. Practice for this three-race combination NASCAR Heat, rFactor, and rFactor2 begins at 7:30pm, with the Drivers Meeting taking place at 8:40. These races have no Time Trials so that the first Feature Race can start around 9:10pm The full race format and schedule of events is available on the SUPRS schedule page. Follow your favorite SUPRS racers while you view timing, scoring, and live streaming video of all the supermodified sim races on 11/6/18 from Featherlite Speedway, Richmond International Raceway, and Oswego Speedway “Live @ 9pm est via the SUPRS LIVE!page. The SUPRS LIVE! experience includes in-car camera views as well as the main video screen and it’s a great place to spend you evening after voting while learning more about supermodifieds and the original supermodified sim racing sanction. Online sim racers, gamers, and supermodified racing fans can all learn more about the original supermodified sim racing sanction by visiting www.SUPRS.net, “Liking” SUPRS on Facebook, Circling SUPRS on Google+, Following @SUPRSOnline on Twitter, and Viewing SUPRS videos on YouTube. We’re also on Instagram @suprs_online, and don’t forget to check out our live streaming video at select races throughout the season via our SUPRS LIVE! page and Twitch channel. 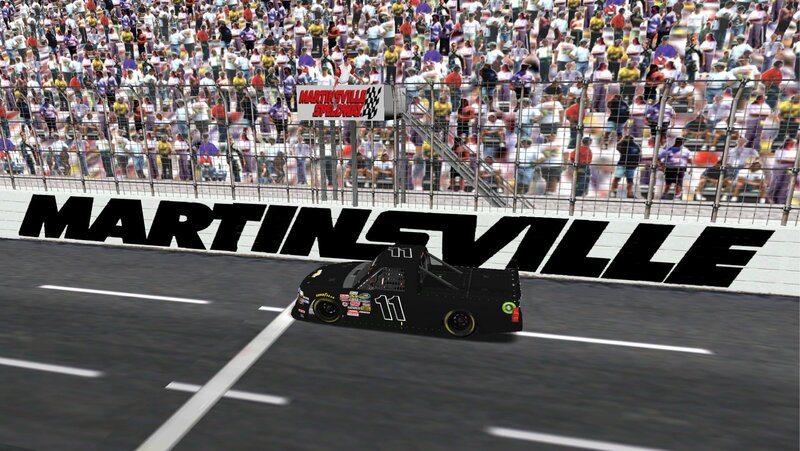 Speedyman11 Wins the The Paperclip 100.